I am working on Direct Conversion Receiver projects at the work bench. (Kind of a baby step.) Yesterday I had tried to wire up a SA612+LM386 and was getting nothing, nadda, big zero for audio. 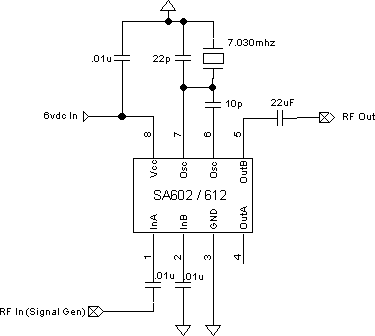 For what ever reason I was struggling to figure out why my SA612 was not working properly. After running errands earlier today (Sunday) I got some free time late in the afternoon. I decided to put the SA612 on a fresh breadboard (I hate breadboarding) and start from scratch. The circuit is pretty simple. It worked right away this time and I am not really sure why. It took about 5 minutes to wire up & attach the test gear. 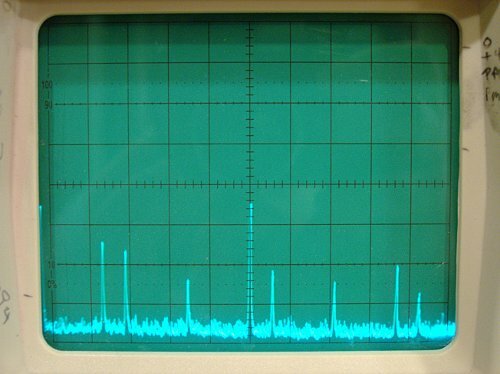 I had nice signals, good fundamental from the crystal, good RF from the signal generator, nice sum & difference products, and lots of harmonics. The SBL1 is pretty darn easy to work with and the NE602/SA612 is not much more difficult. When time permits I can move on the next phase of the experiment.